Department of Chemistry 1, Centre for Plant Materials and Herbal Products Research 2, Department of Zoology 3, Faculty of Applied Sciences, University of Sri Jayewardenepura, Gangodawila, Nugegoda 10250, Sri Lanka. ABSTRACT: Cinnamon commonly known as ‘Kurundu’ in Sri Lanka has been used as a spice since antiquity. It is obtained from the inner bark of several species of the genus Cinnamomum that belongs to the family Lauraceae. Among the cinnamon species, Cinnamomum verum (syn. Cinnamomum zeylanicum Nees) is native to Sri Lanka and is also known as “Ceylon” cinnamon or “true” cinnamon. Cinnamon produced in Sri Lanka has acquired a long-standing reputation in the international market. Today, there are many value-added products of cinnamon in the local and international market. Through a market survey four value-added cinnamon products in the Sri Lankan market containing 100% cinnamon inner bark were identified and have been subjected to chemical and biological studies along with the inner bark of true cinnamon. Phytochemical screening of 80% aqueous methanol extracts of cinnamon samples was carried out according to previously published methods. All the extracts revealed the presence of alkaloids, flavonoids, proanthocyanidins, tannins, triterpenoids and saponins and the absence of steroids and cyanogenic glycosides. The total phenolic content and anti-oxidant activity of freeze-dried 80% aqueous methanol extracts of cinnamon samples were determined by Folin-Ciocalteu and DPPH radical scavenging assays respectively according to previously published methods with modifications. Of the cinnamon samples used for the study, the highest total phenolic content and anti-oxidant activity was exhibited by the freeze-dried 80% aqueous methanol extract of cinnamon stick, which was higher than that of cinnamon bark. The coumarin content of 80% aqueous methanol extracts of cinnamon samples were determined by a modified HPLC method and was found to be below the LOD. LOD was below the maximum level for coumarin in food and beverages as specified by European Commission. α-Amylase inhibition assay and in-vitro hypoglycemic effect of cinnamon samples were carried out according to previously published methods. The highest α-amylase inhibitory activity among the cinnamon samples was exhibited by the 80% aqueous methanol extract of cinnamon stick. All the cinnamon samples used for the study enhanced the glucose uptake in yeast cells suggesting that they may have an effect on controlling blood glucose levels in humans. 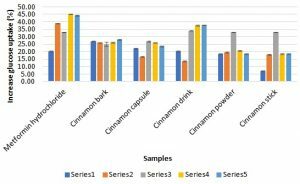 Findings of this research maybe of potential use to give a scientific backing to the value-added cinnamon products in the local and global market. INTRODUCTION: Cinnamon commonly known as ‘Kurundu’ in Sri Lanka has been used as a spice since antiquity. It is obtained from the inner bark of several species of the genus Cinnamomum that belongs to the family Lauraceae. Among the cinnamon species, Cinnamomum verum (syn. Cinnamomum zeylanicum Nees) is native to Sri Lanka and is also known as “Ceylon” cinnamon or “true” cinnamon 1. Unique properties in aroma, taste and chemical composition of Ceylon cinnamon make it high quality among cinnamon species 2. Cinnamomum verum is used intensively in traditional medicine and has been reported to possess diverse pharmacological properties 3. In traditional medicine cinnamon is used to treat diabetes, cholesterol, arthritis, diarrhea, common cold, indigestion and menstrual irregularities 3, 4. Current research suggests that cinnamon possess anti-microbial, anti-oxidant, anti-inflammatory, anti-lipidemic, anti-cancer and anti-diabetic properties.5, 6 Cinnamon produced in Sri Lanka has acquired a long-standing reputation in the international market. Today, there are many value-added products of cinnamon in the local and international market. There is no previous work reported on chemical and biological studies on value-added cinnamon products available in the Sri Lankan market. Here, we report chemical and biological studies of value-added cinnamon products available in the Sri Lankan market containing 100% cinnamon inner bark compared to that of true cinnamon. Chemicals and Reagents: Coumarin (99.9%, HPLC), acarbose (≥ 95%), 1,1-diphenyl-2-picryl-hydrazyl (DPPH), soluble starch, D-glucose, Saccharomyces cerevisiae yeast, 3, 5-dinitrosalicylic acid (DNS), 2-aminoethyl diphenyl borinate (Natural Product Reagent-NPR) and porcine pancreatic α-amylase were purchased from Sigma Aldrich (USA). HPLC grade methanol and water were purchased from Fisher Scientific (UK). Disposable nylon filters with pore width 0.2 µm and liquid chromatography (LC) vials were purchased from Agilent Technologies (Sri Lanka). All other chemicals, reagents and solvents used in this study were of AR grade. Water when used was distilled through GFL distillation apparatus. Instrumentation: Absorbance measurements were carried out on a Thermo Scientific™ GENESYS 10S UV-vis spectrophotometer. HPLC analysis was performed on an Agilent (Santa Clara, CA, USA) 1260 Infinity HPLC quaternary LC system with quaternary pump, autosampler, thermostated column compartment, diode array detector and variable wavelength detector. LC separation was performed on a reversed phase column (Agilent Eclipse Plus C18, 4.6 × 250 mm, 5 μm) thermostated at 25 ºC using mobile phase A (methanol) and mobile phase D (water) in an isocratic program (60% A: 40% D) with a flow rate of 0.5 mL/min. Injection volume was 20.000 μL and detection was carried out at 278 nm wavelength. Plant Material: Fresh inner bark of Cinnamomum verum was obtained from a healthy tree grown in a plantation located in Galle (Southern Sri Lanka) during the month of February 2017 and was used for the study after authentication (voucher no. 6/01/H/03). The inner bark was dried for two weeks and cut into pieces. Dried bark pieces were ground into a fine powder and stored in a sealed polythene cover at -20 °C until further use. Value-added Cinnamon Products: Through a market survey around Colombo, four varieties of cinnamon value-added products containing 100% cinnamon inner bark were identified. They were cinnamon capsule, cinnamon drink, cinnamon powder and cinnamon stick. Samples manufactured during the same time period were chosen for the study. Three samples from each product having the same batch number were purchased. Cinnamon capsule was opened and the powder inside was used in the analysis. Sachet packet of cinnamon drink was cut open and fine pieces inside were used for the analysis. Cinnamon powder was used without any modifications. Cinnamon sticks were cut into pieces and were ground into a fine powder. All samples were stored in sealed polythene covers at -20 °C until further use. Preparation of Extracts from Cinnamon Samples: Powdered cinnamon bark (75.0 g) was refluxed with 750.0 mL of 80% aqueous methanol for 1 h. The extract was cooled to room temperature and filtered. Half of the extract was subjected to phytochemical screening. The remaining portion was concentrated under vacuum and the resultant aqueous solution was freeze-dried to produce a red brown solid. The freeze-dried sample was stored in a plastic container at -20 °C. The same procedure was followed for value-added cinnamon products. Phytochemical Screening: All 80% aqueous methanol extracts of cinnamon samples were subjected to phytochemical screening according to previously published methods 7, 8. Powdered original cinnamon samples (100 mg) were used for screening of saponins. Confirmatory Test for Flavonoids: Thin layer chromatography (TLC) studies of 80% aqueous methanol extracts of cinnamon samples were carried out on precoated Kieselgel 60 F254 plates to confirm the presence of flavonoids 9. NPR was used as the visualizing agent. Developed spots were observed before and after spraying NPR reagent under UV light at 254 nm and 365 nm respectively. Determination of Total Phenolic Content: The total phenolic content of cinnamon samples was determined using the Folin-Ciocalteu method according to a previously published method with modifications 10. Aqueous Na2CO3 solution (7.5%) was prepared by dissolving sodium carbonate (7.500 g) in 100.0 mL of distilled water. Folin-Ciocalteau solution (10%) was prepared by diluting 10.0 mL of Folin-Ciocalteau reagent with 90.0 mL of distilled water. A weight of 0.010 g of freeze-dried 80% aqueous methanol extract of cinnamon bark was dissolved in 100.0 mL of methanol. An aliquot of 1.0 mL of prepared test solution was mixed with 4.0 mL of 7.5% Na2CO3, 5.0 mL of 10% Folin Ciocalteau solution and incubated at 45°C for 15 min. Absorbance was measured at 765 nm using UV-vis spectrophotometer. The same procedure was carried out for freeze-dried 80% aqueous methanol extracts of value-added cinnamon products. Gallic acid stock solution was prepared by dissolving 0.010 g of gallic acid in 100.0 mL of methanol. Working standard solutions of gallic acid (40, 50, 60, 70 and 80 μg/mL) were prepared by diluting the stock solution with methanol. Working standards were treated with as described previously and absorbance was measured. Control was prepared by adding 1.0 mL of methanol instead of sample solution. All experiments were carried out in triplicate. Absorbance against concentration of working standard solutions were plotted to construct the standard calibration curve. The total phenolic content was expressed as mg of gallic acid equivalent (GAE) per g of the weight of sample and was calculated using the following equation. Determination of Coumarin Content: Determina-tion of coumarin content of cinnamon samples was carried out according to a previously published HPLC method with modifications11. To extract coumarin, powdered inner bark of cinnamon (0.50 g) was shaken in a thermostatic shaker (60 °C) for 30 min with 20.0 mL of 80% aqueous methanol. The solution was centrifuged for 10 min at 3000 rpm. The mixture was decanted and the supernatant was filtered through a Whatman no. 01 filter paper and final volume was adjusted to 15.0 mL with 80% aqueous methanol. A volume of 20.000 µL from the extract was subjected to HPLC analysis using mobile phase A (methanol, 60%) and mobile phase D (water, 40%), which gave a well-resolved peak for coumarin. Coumarin peak was confirmed by HPLC analysis of a coumarin solutions using above-mentioned mobile phases. The same procedure was carried out for value-added cinnamon products. All experiments were carried out in triplicate. Peak area for coumarin was obtained separately and corresponding concentrations were determined using the standard calibration curve of coumarin, which were constructed as given below. Stock solution of coumarin was prepared by dissolving 0.010 g of coumarin in 100.0 mL of 80% aqueous methanol. Working standards of coumarin (2, 3, 5, 7 and 10 µg/mL) were prepared by diluting the stock solution with 80% aqueous methanol. After filtration through 0.2 µm nylon membrane filter, a 20.000 µL aliquot from each solution was subjected to HPLC analysis using previously mentioned mobile phases. Standard calibration curve for coumarin was constructed plotting peak area obtained for coumarin against working standard concentration. The limit of quantification (LOQ) and limit of determination (LOD) were calculated for coumarin using following formulae. In-vitro Antioxidant Activity: Antioxidant activity of cinnamon samples were determined using DPPH assay according to a previously published method with modifications 12. DPPH stock solution was prepared by dissolving 19.60 mg of DPPH in 500.0 mL of methanol. A weight of 0.010 g of freeze-dried 80% aqueous methanol extract of cinnamon bark was dissolved in 100.0 mL of methanol to prepare sample stock solution. A concentration series (62.5, 31.25, 15.625, 7.81 and 3.90 μg/mL) was prepared by diluting stock solution with methanol. An aliquot of 1.50 mL of sample solution was mixed with 1.50 mL of freshly prepared DPPH solution and allowed the solution to stand at room temperature in the dark for 30 min. Discoloration of the solution was measured at 517 nm using the UV-visible spectrophotometer. The same procedure was carried out for freeze-dried 80% aqueous methanol extracts of value-added cinnamon products. As the control, 1.50 mL of DPPH solution with 1.50 mL of methanol was used. Ascorbic acid was used as the standard. All experiments were carried out in triplicate. The percentage of DPPH radical scavenging was calculated using the following formula. Percentage of DPPH radical scavenging was plotted against sample concentration and the resulting logarithmic regression curve was used to calculate the IC50 value for each cinnamon sample separately. α-Amylase Inhibition Assay: α-Amylase inhibition assay for cinnamon samples was carried out according to a previously published method with modifications 13. A starch solution (0.5%, w/v) was prepared by dissolving 0.25 g of potato starch in 50.0 mL of distilled water and then boiling for 15 min. Phosphate buffer (pH 6.9) was prepared by mixing 0.590 g of sodium phosphate with 0.097 g of sodium chloride and diluting up to 250.0 mL with distilled water. The pH of the resultant mixture was adjusted to 6.9 using a pH meter by adding 1 M aqueous NaOH solution. α-Amylase enzyme solution was prepared by dissolving 0.0010 g of α-amylase in 100.0 mL of buffer. A weight of 0.010 g of freeze-dried 80% aqueous methanol extract of cinnamon bark was dissolved in 10.0 mL of DMSO (dimethyl sulphoxide). A concentration series (250, 125, 62.5, 31.25 and 15.625 μg/mL) was prepared by diluting the stock solution with DMSO. An aliquot of 200.0 µL sample solution was mixed with 200.0 μL of enzyme solution and incubated at 25 °C for 30 min. A volume of 10.0 µL from starch solution was added to the mixture and further incubated for 3 min at 25 °C. Incubated samples were mixed with 200.0 μL of DNS reagent and heated for 15 min in a water bath at 85 °C. Resulting mixtures were cooled to room temperature and diluted with 1800.0 μL of distilled water. Absorbance was measured at 540 nm using the UV-visible spectrophotometer. The same procedure was carried out for freeze-dried 80% aqueous methanol extracts of value-added cinnamon products. Metformin hydrochloride was used as the positive control. Instead of sample solution, 200.0 μL of DMSO was used for the blank. All experiments were carried out in triplicate. Percentage of α-amylase inhibition was calculated using the following formula. Percentage of α-amylase inhibition was plotted against sample concentration and the resulting logarithmic regression curve was used to calculate the IC50 value for each cinnamon sample separately. In-vitro Hypoglycemic Effect: In-vitro hypoglycemic effect was determined using yeast glucose uptake model according to a previously published method with modifications 14. A yeast solution was prepared by dissolving 0.50 g of commercial baker yeast in 50.0 mL of distilled water and centrifuged at 3000 rpm for 5 min repeatedly until a clear supernatant was obtained. A volume of 10.0 mL of supernatant was dissolved in distilled water to prepare 10% yeast solution. Glucose solution (25 mM) was prepared by dissolving 0.450 g of anhydrous glucose in 100.0 mL of distilled water. A weight of 0.010 g of freeze-dried 80% aqueous methanol extract of cinnamon bark was dissolved in 10.0 mL of distilled water. A concentration series (500, 250, 125, 62.5, and 31.25 μg/mL) was prepared by diluting the stock solution with distilled water. An aliquot of 300.0 µL of sample solution was mixed with 300.0 μL of glucose solution and incubated at 37 °C for 10 min. A volume of 30.0 μL of yeast solution was added to incubated samples and further incubated at 37 °C for 60 min. Resulting mixtures were centrifuged at 2500 rpm for 5 min. Supernatant was mixed with 300.0 μL of DNS and heated for 15 min in a water bath at 85 °C. Solutions were cooled to room temperature and diluted with 1.0 mL of distilled water. Absorbance was measured at 540 nm using UV-visible spectrophotometer. The same procedure was carried out for freeze-dried 80% aqueous methanol extracts of value-added cinnamon products. Metformin hydrochloride was used as the positive control. Blank was prepared by adding 300.0 μL of distilled water instead of sample solution. All experiments were carried out in triplicate. The percent increase of glucose uptake by the yeast cells facilitated by each cinnamon sample was calculated using the following formula separately. Statistical Analysis: Results were represented as mean ± S.D. Statistical analysis was performed with one-way ANOVA, using Minitab® 16.2.3 software. Differences were accepted as statistically significant when P ≤ 0.05. RESULTS AND DISCUSSION: Through a market survey around Colombo, four varieties of cinnamon value-added products containing 100% cinnamon bark were identified. They were cinnamon capsule, cinnamon drink, cinnamon powder, and cinnamon stick. The inner bark of Cinnamomum verum obtained from a plantation in Galle was also used for the study. Powdered cinnamon bark and value-added cinnamon products were refluxed with 80% aqueous methanol for one hour and the resultant extracts were subjected to preliminary phytochemical screening according to previously published methods with modifications 7, 8. Powdered original cinnamon samples were used for screening of saponins. The phytochemical screening of 80% aqueous methanol extract of cinnamon bark revealed the presence of alkaloids, flavonoids, proanthocyanidins, tannins, triterpenoids and the absence of steroids and cyanogenic glycosides. The froth test revealed the presence of saponins. Under the acidic conditions of the flavonoid test, proanthocyanidins present in the extracts may give a false-positive result. Therefore, TLC studies were carried out using ethyl acetate: formic acid: dichloromethane: methanol (6.8: 0.2: 2.8: 0.2) and ethyl acetate: formic acid: glacial acetic acid: distilled water (10: 1.1: 1.1: 2.7) as solvent systems to confirm the presence of flavonoids in 80% aqueous methanol extracts of cinnamon samples. Fluorescence quenching spots observed at UV-254 nm and orange and yellow spots at UV-365 nm after spraying NPR reagent confirmed the presence of flavonoids in the extracts. Mazimba and co-workers have shown the presence of alkaloids, flavonoids, tannins, steroids, triterpenoids and saponins in the methanolic extract of Cinnamomum verum 15. Phytochemical screening results of the present study are in accordance with that of Mazimba and co-workers except for the absence of steroids. The Leibermaan-Burchard test can be used to differentiate triterpenoids and steroids. In this test, steroids are indicated by the development of a blue/green color, where as triterpenoids by the development of a red/violet color 7. In the present study, an intense red-violet color was observed for the Liebermann-Burchard test, which may be masking the blue/green color given by steroids. Phytochemical screening of 80% aqueous methanolic extracts of value-added cinnamon products showed similar results as for cinnamon bark. The total phenolic content of freeze-dried 80% aqueous methanol extracts of cinnamon samples were determined using the Folin-Ciocalteu assay according to a previously published method with modifications 10. The results obtained are given in Table 1. The total phenolic content of freeze-dried 80% aqueous methanol extract of cinnamon bark was 27.64 ± 2.70 mg GAE/g of sample. The total phenolic content of freeze-dried 80% aqueous methanol extract of cinnamon capsule and cinnamon drink was significantly lower, while that of cinnamon powder and cinnamon stick was significantly higher than that of cinnamon bark. 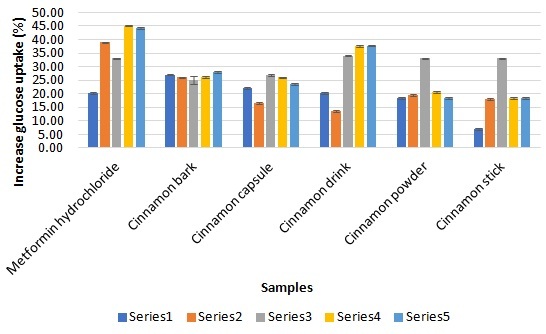 Among the cinnamon samples under study, the highest total phenolic content was exhibited by freeze-dried 80% aqueous methanol extract of cinnamon stick. Quantification of coumarin of cinnamon samples were carried out according to a previously published HPLC method with modifications 11. Coumarin working standards (2, 3, 5, 7 and 10 µg/mL) were subjected to HPLC analyses using mobile phase A (methanol, 60%) and mobile phase D (water, 40%), which gave a well-resolved peak for coumarin. The standard calibration curve for coumarin was constructed plotting peak area obtained for coumarin against working standard concentration. The limit of quantification (LOQ) and limit of determination (LOD) were calculated to be 2.00 mg/kg and 0.661 mg/kg respectively. All 80% aqueous methanol extracts of cinnamon samples were subjected to HPLC analyses separately using previously mentioned mobile phases. In each case the peak area for coumarin was obtained and corresponding concentration was determined separately using the standard calibration curve of coumarin Table 2. In all 80% aqueous methanol extracts of cinnamon samples, coumarin was below the LOD. LOD was below the maximum level for coumarin in food and beverages as specified by European Commission 16. Antioxidant activity of freeze-dried 80% aqueous methanol extracts of cinnamon samples were determined using the DPPH radical scavenging assay according to a previously published method with modifications and the results are given in Table 3 12. The IC50 value of freeze-dried 80% aqueous methanol extract of cinnamon bark was 78.87 μg/mL, while that of ascorbic acid was 8.880 μg/mL. According to the results obtained the 80% aqueous methanol extract of cinnamon bark possess anti-oxidant activity although lower than that of the standard used. The IC50 value of freeze-dried 80% aqueous methanol extracts of cinnamon capsule and cinnamon drink were significantly higher, in fact very much higher, while that of cinnamon powder and cinnamon stick were significantly lower than that of cinnamon bark. Among the cinnamon samples under study, the highest anti-oxidant activity was exhibited by freeze-dried 80% aqueous methanol extract of cinnamon stick. The same extract exhibited the highest total phenolic content amongst the cinnamon samples under study. Inhibition of α-amylase enzyme can prevent rise of glucose levels. Cinnamon samples were subjected to α-amylase inhibition assay according to a previously published method 13 with modifications and the results are given in Table 4. Metformin hydrochloride is a synthetic α-amylase inhibitory drug commonly used in the treatment for type 2 diabetes and was used as a positive control in this study. The IC50 value of freeze-dried 80% aqueous methanol extract of cinnamon bark was 86.84 μg/mL and that of metformin hydrochloride was 53.03 μg/mL. According to the results obtained the 80% aqueous methanol extract of cinnamon bark possess α-amylase inhibitory activity although not the extent of standards used. The α-amylase inhibitory activity of 80% aqueous methanol extracts of cinnamon capsule, cinnamon drink and cinnamon powder are lower than that of cinnamon bark. In fact, the α-amylase inhibitory activity of 80% aqueous methanol extracts of cinnamon capsule and cinnamon drink is significantly lower than that of cinnamon bark. The highest α-amylase inhibitory activity among the cinnamon samples was exhibited by the 80% aqueous methanol extract of cinnamon stick, which was comparable to that of metformin hydrochloride. The ability of cinnamon samples to increase the uptake of glucose by yeast cells in a 25 mM glucose medium was studied using the yeast glucose uptake model 14, which mimics the glucose transportation across the mammalian intestine. The results are graphically represented in Fig. 1. A reduction in the glucose concentration in the medium as indicated by a decrease in the absorbance after 60 min was observed in the presence of all the cinnamon samples and metformin hydrochloride. This suggests that cinnamon samples used for the study are capable of enhancing glucose uptake by yeast cells to prevent glucose escalation. Thus, cinnamon samples may play a role in effective glucose metabolism thereby controlling blood glucose levels in humans. CONCLUSION: The phytochemical screening of 80% aqueous methanol extracts of cinnamon bark and cinnamon value-added products revealed the presence of alkaloids, flavonoids, proantho cyanidins, tannins, triterpenoids, saponins and the absence of steroids and cyanogenic glycosides. Of the cinnamon samples used for the study, the highest total phenolic content and antioxidant activity was exhibited by the freeze-dried 80% aqueous methanol extract of cinnamon stick, which was higher than that of cinnamon bark. Coumarin content of 80% aqueous methanol extracts of cinnamon samples were below the LOD. LOD was below the maximum level for coumarin in food and beverages as specified by European Commission. The highest α-amylase inhibitory activity among the cinnamon samples was exhibited by the 80% aqueous methanol extract of cinnamon stick, which was comparable to that of metformin hydro-chloride. All the cinnamon samples used for the study were capable of enhancing the glucose uptake in yeast cells suggesting that they may have an effect on controlling blood glucose levels in humans. Findings of this research maybe of potential use to give a scientific backing to the value-added cinnamon products in the local and global market. ACKNOWLEDGEMENT: The authors are thankful to the Instrument Center, Faculty of Applied Sciences, University of Sri Jayewardenepura, Sri Lanka for providing assistance for the research project. Arachchige SPG, Abeysekera WPKM and Ratnasooriya WD: Antiamylase, anticholinesterases, antiglycation, and glycation reversing potential of bark and leaf of Ceylon cinnamon (Cinnamomum zeylanicum Blume) in-vitro. Evidence-Based Complementary and Alternative Medicine 2017; 1-13. Maheshwari R, Chauhan A, Gupta A and Sharma S: Cinnamon: an imperative spice for human comfort. International Journal of Pharmaceutical Research & Bio-science 2013; 2(50): 131-145. Medagama AB: The glycaemic outcomes of cinnamon, a review of the experimental evidence and clinical trials. Nutrition journal 2015; 14(1): 108. Ranasinghe P, Pigera S, Premakumara GAS, Galappaththy P, Constantine GR and Katulanda P: Medicinal properties of ‘true’ cinnamon (Cinnamomum zeylanicum): a systematic review. BMC Complementary and Alternative Medicine 2013; 13: 275-275. Kawatra P and Rajagopalan R: Cinnamon: Mystic powers of a minute ingredient. Pharmacognosy Research 2015; 7(S1): S1-S6. Farnsworth NR: Biological and Phytochemical Screening of Plants. American Pharmaceutical Association, 1966. Harborne JB: Phytochemical methods, a guide to modern techniques of plant analysis. Chapman and Hall, 1984. Wagner H and Bladt S: Plant drug analysis, a thin layer chromatography atlas. Springer Science & Business Media, 1996. Javanmardi J, Stushnoff C, Locke E and Vivanco J: Antioxidant activity and total phenolic content of Iranian Ocimum accessions. Food chemistry 2003; 83(4): 547-50. Solaiman RA and Al-Zehouri J: Determination of coumarin in methanol extract of cinnamon (Cinnamomum cassia Blume) using reversed-phase high performance liquid chromatography. Journal of Pharmacognosy and Phytochemistry 2017; 6(4): 726-729. Brand-Williams W, Cuvelier ME and Berset, C: Use of a free radical method to evaluate antioxidant activity. LWT - Food Science and Technology 1995; 28(1): 25-30. Dastjerdi ZM, Namjoyan F and Azemi ME: alpha amylase inhibition activity of some plants extract of Teucrium European Journal of Biological Sciences 2015; 7(1): 26-31. Cirillo VP: Mechanism of glucose transport across the yeast cell membrane. Journal of Bacteriology 1962; 84(3): 485-491. Mazimba O, Wale K, Tebogo E, Tebogo E and Kwape Shetonde O: Cinnamomum verum: Ethylacetate and methanol extracts antioxidant and antimicrobial activity. Journal of Medicinal Plants Studies 2015; 3(3): 28-32. Council of the European Communities. Council directive of 22 June 1988 on the approximation of the laws of the member states relating to flavourings for use in foodstuffs and to source materials for their production (88/388/EEC). Official Journal of the European Communities: Legis. 1988; L184: 61-66. Wickramasinghe WTHC, Peiris LDC and Padumadasa C: Chemical and biological studies of value-added cinnamon products in the Sri Lankan market. Int J Pharm Sci & Res 2018; 9(11): 4674-81. doi: 10.13040/IJPSR.0975-8232.9(11).4674-81. Authors Address: Department of Chemistry, Faculty of Applied Sciences, University of Sri Jayewardenepura, Gangodawila, Nugegoda 10250, Sri Lanka.